(1) The Electra did not go down at sea. (2) They did not go to the uninhabited Phoenix Islands such as Baker, Gardner (Nikumaroro), Canton, McKean, etc., where they would have been completely cut off from other human beings who could have helped them. Calvin Pitts, circa 2014, in The Final Journey gallery at the Claremore, Okla., Will Rogers Memorial Museum. Pitts’ interest in aviation history led him on an unlikely journey around the world. In 1981 Calvin made a round-the-world flight commemorating the 50th Anniversary of the Wiley Post-Harold Gatty round-the-world flight in 1931. 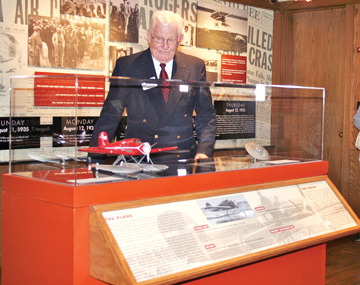 The flight was sponsored by the Oklahoma Air & Space Museum. (3) The Gilberts had thousands of friendly people who could have helped, although the Electra probably would have been sacrificed in that case, since there were no runways, with this option supporting the logic of No. 2 above. (4) They did not turn back to the Gilberts, deciding not to follow the contingency plan so carefully laid out with Gene Vidal, a matter written about often. (5) They did not land at Howland. (6) The Electra was never seen by personnel on the Itasca or on Howland. (7) The Electra never made an approach to Howland’s runway. (8) There must have been a reason the all-important trailing antenna was removed. (9) Fred Noonan had a 2nd class radio license, which required knowledge of Morse code, a knowledge he demonstrated with Alan Vagg between Australia and Lae. (10) There must have been a reason Amelia was so casual with her radio calls. (11) Noonan was not drunk the night before the final takeoff from Lae. (12) Amelia was radio-savvy at first, maintaining two-way conversations with Harry Balfour at Lae until her position report at 0718z / 5:18 p.m. local time over Nukumanu Atoll. (13) Amelia had no two-way conversations with the Ontario nor the Itasca at Howland. (14) Although Amelia requested only voice-talk, Itasca’s radioman William Galten keyed 50 Morse code transmissions by himself, plus those sent by other Itasca radioman, indicating that they had not been so informed. (15) Neither Nauru nor Tarawa Radio, important mid-range stations, had been informed. (16) The mid-range ocean station, the Ontario, had not been properly informed. (17) With government involvement in everything else, the key radio players, both Navy and ground, were ill-informed on the very last half of the Howland leg. (18) The Howland runway log, which was hidden for years, now reveals that the men who constructed the runways did not consider the longest 4,000-foot, north-south runway to be safe due to soft-spots, massive numbers of birds and daily crosswinds of 20 mph. (19) By the same token, the east-west runway for wind was only 2,400-feet long, too short. The width of the entire island was only one-half mile, with sloping beaches. Perhaps the last photo taken before the fliers’ July 2 takeoff from Lae, New Guinea. Mr. F.C. Jacobs of the New Guinea Gold Mining Company stands between Amelia and Fred. Note that Fred looks chipper and ready to go, not hung over from a night of drinking, as some have been alleged. (20) With 30 days of pressure, problems and decisions, the Electra crew was exhausted with extreme fatigue by the time they took on their most dangerous assignment. (21) The Electra came back to earth near Barre Island on Mili Atoll. (22) The Electra pair were taken by the Japanese to their Marshalls headquarters at Jaluit. (23) Amelia and Fred were flown to Saipan, where they were imprisoned. (24) While under Japanese imprisonment, the Electra crew lost their lives. (25) Via Tokyo, the Japanese lied to the U.S. government throughout the early days of the search about the movements of the Kamoi and the results of their search. (26) In 1937, the Unites States, having broken the naval and diplomatic codes of Japan, could listen to radio conversations between Japanese naval vessels in the Pacific, and Saipan, the Marshalls and Tokyo. (27) Three of the most senior U.S. military leaders of World War II in the South Pacific, Gen. Alexander A. Vandergrift, Gen. Graves Erskine and Adm. Chester W. Nimitz, independently knew about the presence of the Electra and the fliers on Saipan, and each informed Fred Goerner or his close professional associates of their knowledge. (28) By extension and by all available evidence and common-sense deduction, the top U.S. political leader — President Franklin D. Roosevelt — also knew that the Japanese had custody of the fliers at a very early date. (29) Some evidence suggests that documents revealing the facts in the disappearance of Amelia and Fred are filed in a “World War II” file, even though the disappearance occurred four years BEFORE the war. 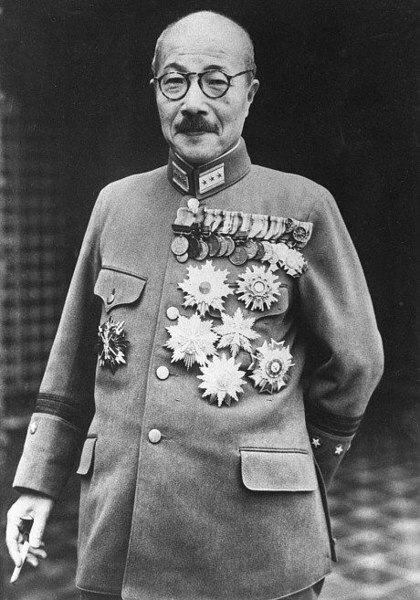 Hideki Tojo (1884 to 1948) was a general of the Imperial Japanese Army (IJA), the leader of the Imperial Rule Assistance Association, and the 27th Prime Minister of Japan during much of World War II, from Oct. 17, 1941, to July 22, 1944. As Prime Minister, he was responsible for ordering the attack on Pearl Harbor. After the end of the war, Tojo was arrested and sentenced to death for war crimes by the International Military Tribunal for the Far East, and hanged on Dec. 23, 1948. He was also culpable for the arrest, captivity and murders of Amelia Earhart and Fred Noonan on Saipan, though this information has never been officially revealed. (30) To this day, the Earhart documents are labeled “Top Secret” (although the U.S. government denies any such files remain classified, or that they even exist) for a civilian who just wanted to finish off her career with a world flight “just for the fun of it.” What is this overkill attempting to hide, and if there’s “nothing to hide,” then why do the establishment and its media toadies continue their blanket denials of a truth that’s hiding in plain sight? If these 30 factual bits of evidence, and much more, are not sobering enough, there are more, under the heading of “Human Factors,” keeping in mind that this list, while exhausting, is not exhaustive. (a) her intense personal interests. (b) her desire for an adventure not yet experienced. She had done what Lindbergh did, in her 1932 Atlantic solo flight, showing that a woman can do what a man can do, something extremely important to her. But she had never done what her close friend, Wiley Post, had done twice. One of Amelia’s passions was to demonstrate to the next generation of girls that the world is open to them, but they must reach for it. Don’t downplay the power of this motivation. She wanted to be a role model while adding to her records. She wanted both fame and immortality, to be an example as a leader of women for generations of girls to follow. (c) by labeling her plane “A Flying Lab,” she added a scientific motif, like Wiley Post, for her activities. If, in the course of her flying, she could test things like a new direction finder etc., that would add credibility and justification for all the money she and others were investing in the world flight. (d) Amelia’s big heart, especially toward girls just starting out, that always reached out to see how she could help, first as a social worker, a nurse, as a teacher and finally as a role-model. She never stopped promoting her own interests, but not at the expense of failing to help girls who wanted to follow her example. For the 1930s, she was a great role model, not as a fake, pretend movie star, but as a truly outstanding performer in her own real adventures. (2) Amelia had had many setbacks in her aviation career. She crashed a plane while in the process of taking flying lessons. She had more than one engine fire. Although she did well, she did not win the Powder Puff Derby. Third place is never good enough for a first-class person. She had more than one crack-up. But with determination, she not only survived, she prevailed, proving that determined women are equal to men. In spite of setbacks, she had great confidence. As a professional pilot and former instructor, I often spotted a potentially dangerous quality in student-pilots, not confidence, but overconfidence, confidence that exceeded their ability at the time. With wrong circumstances, it is a dangerous quality. Respecting one’s own self-acknowledged limitations is the heart of safety. (3) Amelia’s radio behavior on the world flight was uncharacteristically strange. Who can understand or explain it? It bordered on unprofessional, unless there was a bigger player and a bigger reason that influenced the entire operation. In preparation for Flight No. 2 in Oakland and Miami, several of the Pan Am workers revealed some not-so-pretty things about Amelia’s rudeness and temper. Pan Am’s offer for radio support and flight following was uncharacteristically refused, at no cost to her — why? That borders on irrational, unless something else was afoot. In my opinion, a woman, fighting a man’s world, finds it more difficult than does a man. I can spot several things in Amelia’s world flight that illustrate over-confidence and negligence in accepting one’s own limitations. That was a demon flying with her that she did not need. Her interactions with Paul Mantz are a great illustration of this. He saw several things that he didn’t think were good, and tried to change them, but she found it hard to listen. Next, we must ask, WHAT DO WE NOT KNOW? From what we do know, we evaluate the things we do not know. Because of the unselfish work of others, we are satisfied that we know the essence of what did happen. From the words of the three flag officers, they tell us that the Electra and its crew were on Saipan. For us, the end of the story is solid. For reasonable people, this answers the central essence of the WHAT of the story. But the WHY remains unanswered. Were the Marshalls the ORIGINAL destination of the fliers? That strictly depends on the meaning of the word ORIGINAL. If you identify the origin as that point just following 2013z / 8:43 a.m., where we came to see “Intent,” then YES. From that point, Amelia intended to fly to the Marshalls. If, however, you mean something else, then several scenarios arise. (1). Original destination No. 1? Did Amelia intend to go to the Marshalls when she began Flight No. 1 going west toward Hawaii? No. That’s too much of a stretch. (2). Original destination No. 2? Was that her intent when she left on Flight No. 2, flying the opposite direction? Here it gets complicated. Did those military men who had a private meeting with her while the Electra was being repaired, suggest a plan that included the Marshalls? I don’t think we will ever know how much the government spoiled Amelia’s innocent preparations with secret plans. Whatever they injected was poison from the beginning, no matter if it was as benign, as is one of my scenarios. What “military men,” one asks? 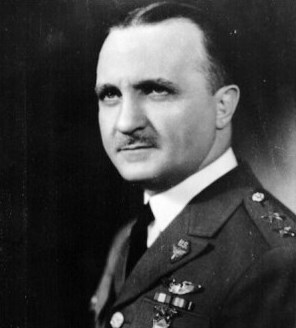 Maj. Gen. Oscar Westover, chief of the Army Air Corps from 1935 until his death at age 55 in a plane crash on September 21, 1938. Did Westover, along with FDR crony Bernard Baruch, approach Amelia Earhart in the spring of 1937 on behalf of President Franklin D. Roosevelt and ask her to perform a special mission? Some evidence does suggest the possibility. (3). Original destination No. 3? Did the U.S. government suggest something in Miami while the Electra was being fitted with new radios and having their lifeline, the trailing antenna, removed? Some very suspicious things happened there, giving rise to some strange actions and reactions on Amelia’s part. Currently, with the limited knowledge we have, my “original destination” begins in what I call Area 13 during the time shortly after 2013z / 8:43 a.m. Howland time. And if that were case, you need to explain precisely why they would want to head for Jaluit as an original destination, and not Howland. For me, Jaluit as an “original destination” began at about 2013z / 8:43 am on July 2, 1937, unless the government involvement started in Oakland or Miami. That is possible, but if that happened, then the Marshalls may have been a “faint,” or a ruse. The military involvement versus the lesser government insertion, is a stretch, but believable with the information we have. At this point, Amelia appears to still be a “peace-loving,” war-hating citizen like Lindbergh and his Isolationists. Whatever sinister part she was contemplating still seems, at this point, to be somewhat innocent, as “My Earhart Scenario” lays out. It is still difficult to see her as a “heavy hitter” connected with a military plot, although the later condemning words of Secretary of the Treasury Henry Morgenthau Jr. seem very convincing. This seems much too sinister for the Amelia of 1936, as well as 1937. A “little favor,” perhaps, but not Truk or Jaluit reconnaissance. Yet, we keep hearing the theme of Morgenthau and FDR saying, in effect, If the public knew, it would be so bad that it would totally ruin Amelia’s reputation. I also tend to the belief that it’s most probable that the decision was made to head for Jaluit at some point, but am not at all certain about this. Other possibilities do exist, that’s why the how and the why of their Mili landing is the true mystery in the Amelia story. This map appeared in the September 1966 issue of True magazine, along with a lengthy preview of The Search for Amelia Earhart. 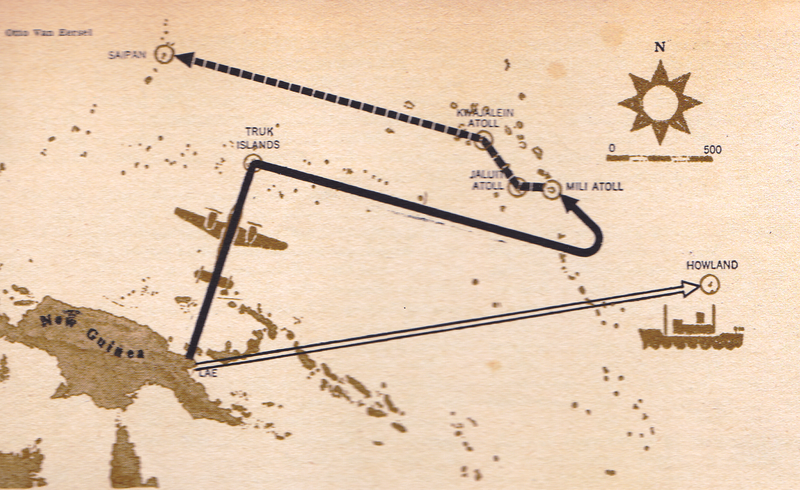 Based on Fred Goerner’s theory of a possible Earhart flight over Japanese-controlled Truk Island, once known as the “Gibraltar of the Pacific.” Could this have been the route the fliers took that led to their demise on Saipan? Calvin Pitts doubts it, but others are not so sure. 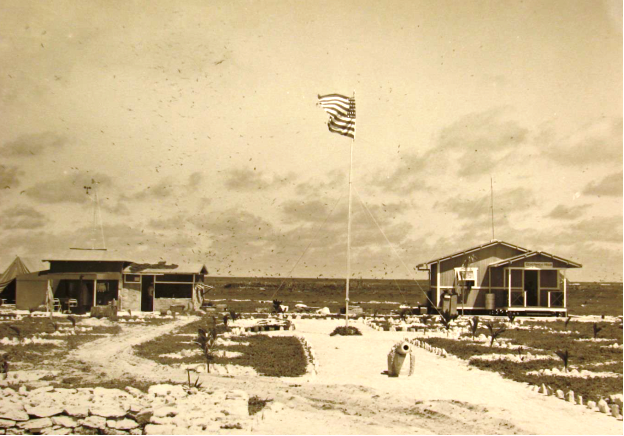 Japanese headquarters, Jaluit, Marshall Islands, was probably their intended destination because of its strong radio signals. Capt. Almon Gray of Pan Am, who flew with Noonan, said: “Fred often listened to Jaluit on his Pan Am flights, taking bearings on them.” This general territory was not new to Pan Am navigators. However, Mili probably came into the picture unexpectedly. After more than 24 hours of flying, when Amelia saw Mili Atoll en route to Jaluit 150 miles away, she had to know she was down to mere drops in the fuel tanks. One engine may have started sputtering, signaling imminent fuel exhaustion. Both engines would seldom run out of fuel at the exact same time. Hence, it’s “make a controlled landing now, or a gliding landing into the water later with only minimum control.” This would account for landing at Mili, short of Jaluit. Once I was convinced that Amelia intended to go to the Marshalls, the next question was: To what destination? Jaluit was the most logical, since it was the source of the radio signals, plural, because there were 11 reported radio stations there. Jaluit, in my opinion, was where Amelia thought she could get fuel and help. As for Mili being the spot where they actually landed/crashed, that was probably a glitch in the plan. The Mili landing was forced on them, as I view it, due to fuel starvation. Ironically, during the period of the world flights, few of Amelia’s expectations seemed to play out precisely as she intended, including Honolulu, Oakland, Miami, Africa, Australia, Lae, Nukumanu, Howland and now Jaluit. In fact, the original change in direction from Flight No. 1 was probably not her idea in the beginning, but was the result of the “military men” who met with her at March Field. 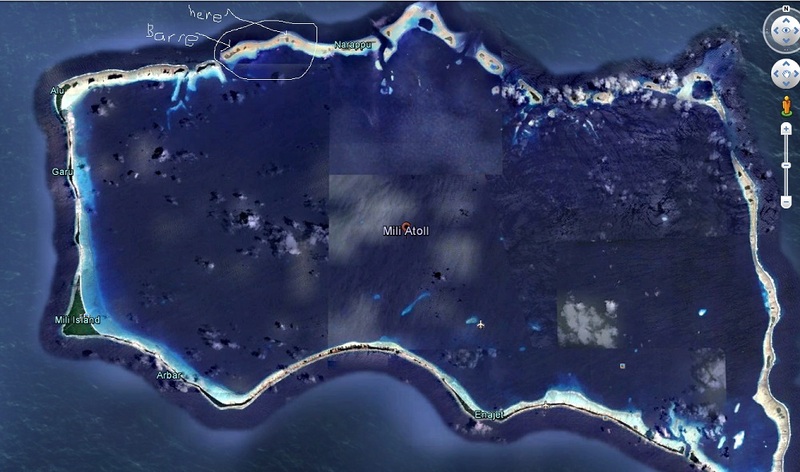 A satellite view of Mili Atoll from space, with Barre Island and “here” indicated in the northwest area as the spot where Amelia Earhart and Fred Noonan landed on July 2, 1937. Photo courtesy Les Kinney. Probably, it was not that she wanted the government involved in her plan, other than helping with details such as clearances, landing sites, fuel, radio help, etc. It seems the government might have hijacked her personal adventure by offering help-with-a-price tag. As I’ve said many times, the more I learn, the less I know. But what did Adm. Chester W. Nimitz mean when he told Fred Goerner through Cmdr. John Pillsbury, “You are on to something that will stagger your imagination”? I confess, this is strange language, and its meaning remains obscure. We simply do not know! Not for a moment should we sell Amelia short. She did what most men could never do, or at least have never done, nor even tried. It took determination, stamina, passion, foresight, commitment, confidence and character. She was the best — flawed, yes, (join the human race), but the best. And she gave it her best. For that, she is to be applauded and respected for bringing to the surface of reality the achievements of a woman who will always be remembered as a record-holder, a role model and a regal angel who was at home in the air, leaving footprints in the sky. Amelia, even with those things we don’t know nor understand, we salute you! (b) Military men met with her privately, removing George Putnam, Amelia’s husband, and Margot DeCarie, her personal secretary, from the room. 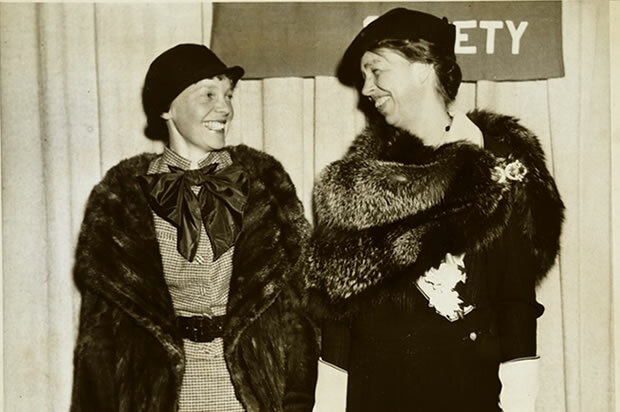 Amelia met Eleanor Roosevelt at a White House state dinner in April 1933, and they were said to have “hit it off.” Near the end of the night, Amelia offered to take Eleanor on a private flight that night. Eleanor agreed, and the two women snuck away from the White House (still in evening clothes), commandeered an aircraft and flew from Washington to Baltimore. After their nighttime flight, Eleanor got her student permit, and Amelia promised to give her lessons. It never happened. Did FDR step in to prevent it? (c) Amelia’s strange flight behavior suggested pre-determined decisions. (d) Her close friendship with Eleanor Roosevelt, with personal interest and involvement by FDR in helping with funding and providing permission for the State Department to help with planning fuel stops. “Do what we can, and contact . . .” was written by his hand on Amelia’s Nov. 10, 1936 personal letter to him. (5). or “disappear over the Gilberts” by landing on a beach, a “small favor” of staying hidden for two weeks to allow the Navy to search the waters without suspicion while actually obtaining maritime information and updated coordinates for islands, including sightings and soundings and military reconnaissance, to be useful for planes and ships if war breaks out, then “find and rescue” the Electra crew, saving their lives for future purposes. THIS IS AN ADVENTURE WHICH WILL NOT DIE UNTIL WE KNOW THE TRUTH. And sometimes, the truth surprises us by its mere simplicity. But then again, who knows? I extend my heartfelt thanks to Capt. Calvin Pitts for his superb analysis of Amelia Earhart’s final flight. In what is clearly a labor of love, Calvin has devoted countless hours to produce this exceptional commentary, and it will take its place among other leading Earhart researchers’ work, to be read often by those who sincerely seek the truth. I’m also confident we will be hearing more from him, as his multiple references to his yet-to-be-published “My Earhart Scenario” suggest. I thought the trailing antenna was broken off during take off at New Guinea? 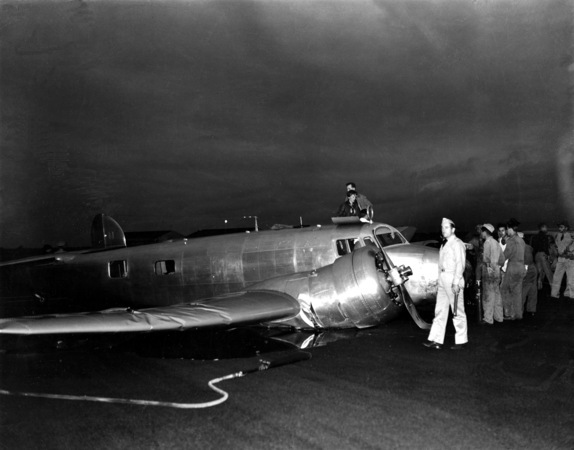 According to Paul Rafford, Jr., in his book,”Amelia Earhart’s Radio,” Section 3 The Americas, pages 30 and 31, the trailing wire antenna was removed by Mr. John Ray shortly after AE and FN arrived in Miami. *Mike & *Calvin – what a *BRILLIANT article to read. You’s have given us, the most concise and comprehensive explanations, to the most complex & incomprehensible matters of Amelia Earhart’s vanishing act; perpetrated by our social media & government all these years. It’s taken me years to get a handle on this, and you’s have spelled it out, so clearly in this *Brilliant article. I *CONGRATULATE your years of HARD work, dedication and to the *TRUTH, by which no other media or book source has ever done. *THANK YOU – Mike Campbell & Calvin Pitts. 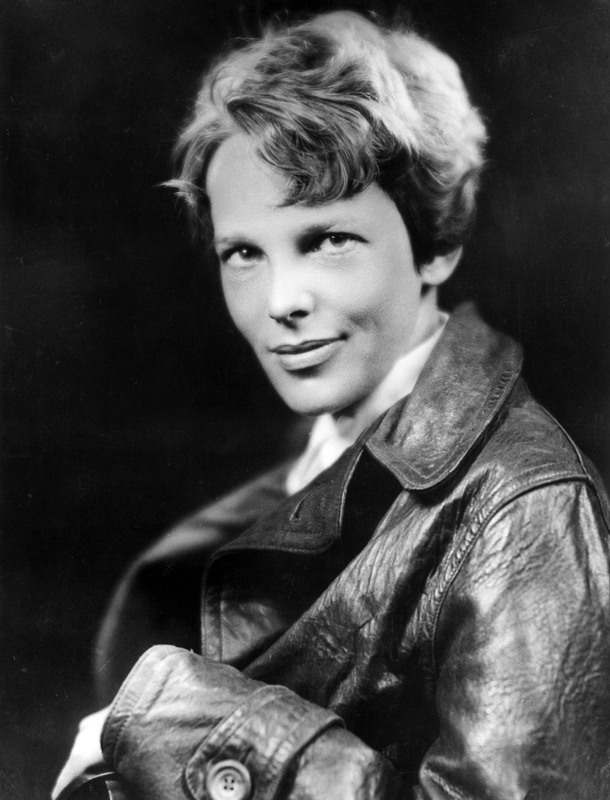 Two TITANS in Earhart research, studies and writings, who have encircled the world, with the *TRUTH. Thank you for your kind comments. Much appreciated. There is more, and maybe before too long we can publish MY EARHART SCENARIO. It may, we hope, tie up some loose ends. This is a labor of love, love for the truth based upon evidence so painstakingly uncovered by others who pioneered this exploration. To them, we owe our salute. Thank you, Sir! I have looked forward to each installment of this series. Now I look forward with eager anticipation to publication of your “My Earhart Scenario.” Like you, I seriously doubt the “Truk Overflight” scenario. To my mind, there were just too many “single points of failure” to overcome to make an overflight of Truk feasible. And, had such a flight occurred and been successful, what would we have learned? Probably not very much as the Japanese really didn’t start to fortify the Mandated Islands, including Truk, until about 1940. In 1937 their main focus was not on a future war with the United States in the Pacific; rather, Japan was focused on China. Whatever plan or scheme that put AE and FN down on Barre Island, Mili Atol, in the Japanese Mandated Marshall Islands was purposeful and very simple. Once they landed, all that was required from AE and FN was to smile, be nice, and stick to their story. If there was a flaw or miscalculation in the plan, it was the mistaken belief on the part of the planners that AE’s charm and international celebrity would guarantee her and Fred Noonan’s safe return. A flawed plan for sure. It’s still hard to imagine AE giving up her dream of a round-the-world flight and proceeding with a plan that would (knowingly) end before completing it. It would be different if she was able to land (hide) somewhere and take off again, but where would that be? And if the plan was to end up in the Marshalls from the get go, why not begin the flight westward as originally planned and save the time, expense and risk of flying 90% around the world? (William- I watched Flight For Freedom; they certainly cast a creepy character to play the Jap spy/clerk at the Hotel in Lae!). Recently finished the Davidson book. Turned out to be much better than expected. Amateurish, but kind of a quick, fun read. Good monochrome photos. Gives a picture of what life is/was like on Saipan. Too bad that Don Kothera didn’t get any identification data for the aircraft he saw in the ravine when it would have been easy. Same could be said for Devine. The reported fire would not have destroyed all the steel data tags or serial numbers stamped on steel components. Agree about the Davidson book. I’ve always said it presented much new and important information, but it’s been largely overlooked because its presentation is not what it should have been. Joe Davidson did his best and was a good guy on the right side of the truth, but he was simply not much of a writer. Have not heard from him in years despite trying, so I have no idea if Joe is still with us, he’d be in his mid-90s by now. Calvin’s account is very believable…I had not previously thought of that possibility, that the fliers were intentionally going to the Marshalls! Forgive me for asking this question if the answer is all spelled out in TTAL, but what was AE’s original flight plan from Hawaii? Was she headed for Howland Island from there? And then to Lae? Was Howland Island a dummy landing strip all along, just meant to fool the Japanese into thinking she was actually headed there? The answers to these questions just don’t come to my mind. One scenario that has come to my mind before is that while Eleanor and Amelia “hit it off” the same might not be true with FDR. Maybe Eleanor confided in Amelia some secret nefarious war plans that the US govt. had in mind and Amelia was going to speak her mind and reveal them publicly. So FDR sent her on what he knew was a suicide for her mission to shut her up for good. I would think AE might have seen through it and not gone on her flight when she learned she had to land in the Marshalls. (Ditching her plane at that, a very dangerous plan) So what they told her in order to get her to go along I can’t even imagine, It’s pretty clear to me that she was always to be sacrificed from the get-go. So I say. The original plan called for an Oakland-to-Oakland flight via Honolulu, then on to Howland Island; Lae, New Guinea; and Port Darwin, Australia. “Part two, a lengthier stretch over fabulous lands,” as Earhart described it, “extended from Australia to the west coast of Africa by way of Arabia.” Part three would take the Electra over the South Atlantic to Brazil and from there northward to the United States. Noonan would go as far as Howland and return to Hawaii by ship. 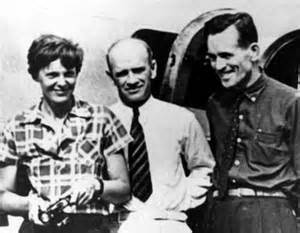 Manning would stay until they reached Australia, and Earhart would fly the rest of the way alone. Constructing a runway on Howland Island, like “Itascatown” before it, supported U.S. claims to the island. It was also a convenient piece of kabuki theater to support AE’s RTW flight that no one thought to dispute. Remember, back in 1937 there were no cable news networks or internet with a non-stop, 24-hour news cycle. People were not constantly bombarded with the latest news or punditry analyzing that news as we are today. News came via radio and newspapers. People back then were, in my opinion, less cynical than we tend to be and, maybe, a little more inclined to trust news outlets and the government. It was a very different time in America. By all indications, Amelia Earhart and Eleanore Roosevelt did indeed “hit it off.” However, I seriously doubt if Eleanor was privy to any “secret, nefarious war plans that the US govt. had in mind….” Eleanore wouldn’t have been a close confidant of FDR’s in such sensitive matters, if she was a close confidant of his in much of anything at all. From what I’ve read, the Roosevelt marriage was not a particularly close or happy one. The smiles were for the cameras and for public consumption. Privately, they had and pursued their own interests. As are all persons in positions of power, FDR was also an adept practitioner of what we now call “compartmentalization.” I’m sure that among his very closest confidants, such as Bernard Baruch and Henry Morganthau, knew only what they absolutely needed to know to serve FDR’s agenda and no more. As evidenced by his later treatment of Charles Lindbergh (by any standard a much admired American hero) vis-a-vis Lindbergh’s isolationism and involvement with the America First movement, FDR clearly demonstrated his capacity to be cruel, ruthless, and vindictive. I get the sense that FDR probably bore little affection for AE and most likely smiled and politely tolerated her because he absolutely had to. It just wouldn’t do to show one’s disdain for “America’s Sweetheart of the Air.” However, behind the charming mask of down-to-earth affability FDR wore for the public, he didn’t give a damn and had the cold-hearted capacity to use AE as he saw fit and then, when she’d served her purpose, throw her away without a second thought or a single twinge of conscience. Regarding landing, and terminating her RTW flight in the Japanese Mandated Marshall Islands, AE was adventurous and courageous. Despite her gentle nature and disposition, the lady had grit. I also believe, her pacifism notwithstanding, AE was nonetheless an American patriot who loved her country deeply. She was also sensible. I don’t think AE (or FN for that matter) would have volunteered to go on a “suicide mission.” However, a mission of vital importance to the nation, with a reasonable and plausible chance of survival and success, initially put to her for consideration by someone close, someone she trusted and admired personally and professionally (Eugene L. Vidal would be an excellent candidate here), well, that’s a different story, isn’t it? I think you and I agree that there was little evidence of FDR’s admiration of or fondness for Amelia, if any. It’s hard to tell or even speculate on what Eleanor knew about the plans FDR had about trapping the Japanese into an unwinnable war for them. On the other hand, what were their motives for secretly building up military purposed bases on the mandated islands? Not to defend against China, certainly. Also I would think they would be of little use in military aggression at that time. Were they more of a defensive nature? After all, I believe, the Japanese fleet that attacked Pearl Harbor sailed from Japan. Perhaps FDR told Eleanor nothing, but she could have heard a lot from various confidants of FDR who were more sympathetic to Eleanor and who frequented the White House. Maybe they were hoping Eleanor could intercede with FDR to alter plans they were not in favor of. What if Amelia secretly turned her flight into an unauthorized peace mission? Of course Morgenthau would be upset with her. Maybe she was intending to divulge plans of the trap FDR was setting for Japan. The powers that existed in 1937 certainly tried to paint Lindbergh as a Nazi sympathizer even though that didn’t seem to me to be his intention. They succeeded at that all right. So, a question I have: With all this technical advice Lockheed was giving her, wouldn’t some of the most important be what length runways she would need with varying fuel loads? At given temperatures? How could she possibly not be aware of that? Did she know that she would not be able to take off from Howland? Did she deliberately crash her plane as audacious as that would have been? Didn’t Manning think that? Somebody did, if I recall correctly. I suspect there is a possibility that AE and Fred were treated very well, relatively speaking, by the Japs for a few days until FDR’s response to the Japanese turned them against her. I believe the Japs were in immediate contact with the U.S. as soon as they rescued her, this story about code breaking is just a false trail promulgated by disinformation operatives. Thanks to the expertise of Calvin Pitts I now have the angle of the make-believe Howland airfield. Probably FDR did want some additional island bases in the Pacific, but I do think Howland Baker and Jarvis were just about useless for military purposes. Thank you Mike for clarifying her initial flight plans. As soon as I definitively solve the AE riddle I will let everyone know. My next blog post is already written, and it’s titled “Did Amelia crash on purpose on Hawaii takeoff?” Don’t miss it! You raise a number of interesting issues, but I will only address just this one regarding, as you state, “….what Eleanor knew about the plans FDR had about trapping the Japanese into an unwinnable war for them.” I will respond taking directly from Rear Admiral Samuel Eliot Morison’s excellent book, “The Rising Sun in the Pacific 1931-April 1942.” Admiral Morison writes in Chapter 1, “The naval limitation treaties, with their nonfortification clauses, seemed to postpone indefinitely all causes of conflict. Economic relations between the two countries were mutually profitable; each produced raw materials and manufactures that the other wanted. No American group or set of interests wanted war with Japan; on the contrary, aversion to such a war was so strong that only a long series of provocations, culminating in the treacherous attack on Pearl Harbor, made war possible. Bottom line: In 1937 Franklin Delano Roosevelt had no great Machiavellian scheme or master plan to ensnare and defeat the Japanese in a war they couldn’t win. William, the fact is we know FDR used “regular citizens” to gather information about foreign countries whether they were allies or foes as far back as 1933. He worked with a group formed in 1927 called The Room. Later, this group, which included William Donovan, became the OSS. See George Victor’s Pearl Harbor Revisited. Hence, it’s no great leap to imagine FDR requesting AE to do America a solid while on her trip. I am looking forward to reading your next blog. One little detail, her refusal to have Pan Am help her with radio contact and navigation was not because she was stupid. It was because she couldn’t have Pan Am know and publicize that she was not flying anywhere near Howland. That’s a dead giveaway that her plan was to fly to the Marshalls (&Truk?) all along. Was there a duplicate C/N 1055 plane being used to deceive the Japs which wound up on New Britain as David Billings believes? Far fetched, yes, but possible. Don’t forget the C/N 1055 was found on a tag on the engine of the wreck where it should not have been. David seems to believe that the Lockheed public records of how many L-10Es were built is accurate. I’m not so sure. Last night I watched a You Tube video by the Dolans about the Forrestal “suicide”. A very good video, but didn’t cover any of his WW2 activities. One thing Dolan pointed out I had never thought of was that disinformation programs don’t always put out “fake news” sometimes the disinformation is the actual truth which then gets called into question and is finally discredited. I don’t know how this fits in with your take on the famous recent TV program, but the Les Kinney photo didn’t have to be fake, it could very well have been genuine (which I believe it was) and was being used to discredit the photo lest a lot of people start believing it. The debunk was thought up long before the program ( by The Jap “researcher”). What they (TPTB) missed was the detail about the construction of the pier which of course the MSM forgot to publicize just like they are instructed not to. You might say the whole program was disinformation which cleverly used the real truth in order to plant doubt in the minds of the 99%. Or maybe you already said just that. Hmmm, maybe I ought to study disinformation further. In fact it is no such thing. Although it is possible this was the reason Amelia refuses Pan Am’s help, by no means can we state it as a certain fact that some covert plan to fly to the Marshalls was her reason for doing so. Logically, one cannot make that leap, as other possible reasons also suggest themselves, prominent among them the fact that Amelia had always been headstrong and resistant to technical assistance, ideas and involvements from others. The idea that AE may have traveled to the Marshall’s at the request of FDR is indirectly supported by the fact that he had established ordinary citizen intelligence groups as early as 1933. Victor Astor headed up a group called The Room from 1927. The group was expanded in 1940 and in cooperation with FDR renamed itself The Club. William Donavan was a member of the original Astor group. What this amounted to was non-military personnel collecting information and forwarding it to FDR’s admin or FDR himself (George Victor, The Pearl Harbor Myth 2008). I think you’re referring to Vincent Astor, who was asked by FDR to take his private yacht into the Marshalls in 1938 to search for AE. He was quickly told to leave by the Japanese. See p. 169 Truth at Last.